Last week Nintendo released the Super Nintendo Classic Edition, aka the “SNES mini,” to the masses. The launch went well and most people who either pre-ordered or who went out early on the morning of release were able to successfully get their hands on a console. For those that didn’t, there’s still hope as Nintendo has now promised to keep producing them until the supply has met up with demand. This comes on the coattails of the debacle that was the Nintendo Entertainment System Classic Edition (NES mini), which last year was nearly impossible for consumers to find on store shelves but countless quantities were available on eBay with a considerable markup. This has caused both consumers and business to prove, yet again, that they understand nothing of the true demand that fueled these particular consoles and why their interest and value will drop considerably once they are available on store shelves. Not only does the mainstream not get it, but clearly video game web sites – who should know better – continue fueling the fire by making waste of text articles about their hopes and dreams for future iterations. Let me come out and say it: there’s little hope for more “mini” consoles in the future, especially if you want anything from the 32-bit era on and anything that used a CD-ROM or larger for its games. Here’s why. I got a press release this morning, like early this morning, from Nintendo. It wasn’t that long, but still too long for this piece, so I’ll lightly extract the important parts. “Due to incredible demand for the upcoming…Super NES Classic Edition system, Nintendo plans to ship the retro-inspired product into 2018.” Oh, it gets better. The press release then goes on in the third paragraph to say, “Next summer, Nintendo will also bring back the…NES Classic Edition system with new shipments.” I’ve already had some celebratory readers, all of which I believe were unable to snag either console to date, reach out and basically say, “we did it.” I’d like to believe these decisions have to do with our combined outcry or even the handful of petitions available to sign online, and either way these efforts have now seen results. With this news comes new questions, concerns, and potential futures, but for now lets just sip our coffee with a smile on our face. While the NES Classic and SNES Classic may be the focal point of my intro, I’m taking all of Nintendo to task with both the great and terrible moves it has made in the past few years. This shortage of consoles is nothing new. I think I’ve been waiting for Nintendo products to come in stock for at least 30 of my 35 years on this earth. In 1987, I was 5, I got an NES for Christmas and wanted to go pick up two games I’d read about in the Nintendo Fun Club newsletter: Castlevania and Mega Man. You see, my birthday is on January 6 so when I would get a new console or portable for Christmas I could usually purchase a game or two immediately following. In January of 1988 it was impossible to get those games, but I can’t tell you whether it was the apparent chip shortage that would plague the holidays in late 1988 or some other factor. This continued with Super Mario Bros. 3 being stealth launched in Summer 1990, frantic shenanigans to get my hands on an N64 (and Mario 64 because the two weren’t always available together) in September of 1996, then similar problems with the GameCube in 2001, and I camped in front of a Best Buy in November 2006 to get a Wii. This doesn’t even account for the waiting for several first party games, terrible customer service on servicing consoles, woes with portables, and so on. I’ve been waiting for Nintendo my entire life and I’ve allowed no other company to treat me this way while still getting my money. To try to make sense of it is an exercise in futility. This week, Nintendo announced the Eastern component to the NES Classic Edition (or NES Mini) that most of us knew were coming. Nintendo did allow some hands on time and offer new information on the NES Classic that will probably apply to the Famicom Classic as well, so check that link above if you haven’t already. 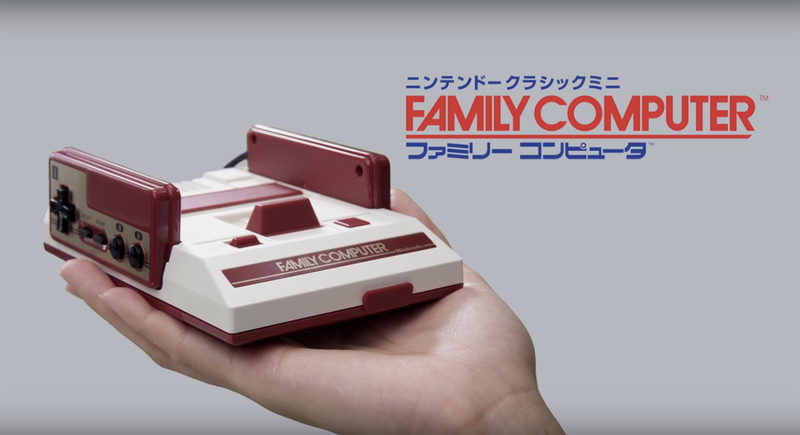 The delightful Famicom Mini is officially called the “Family Computer Classic Edition” and it appears to be quite similar to the Western version save for the obvious aesthetic difference, but also with some details and games. Like the NES Classic Edition it will contain 30 games, it does not accept cartridges, and it will retail for ¥5980 (which at time of writing is literally $59.80). Those of you already hoping to import should expect international shipping to be approximately $20-$30 depending on the speed of shipment and retailer. I’ve already checked and no one currently has it on pre-order, although some bigger import sites do have pages for it, but I suspect it will not have a supply problem as the price point for these consoles suggests it needs to sell a large quantity. Now there are some notable differences that you should be aware of. Of course the games will all be the Japanese counterpart and contain the Japanese versions, but the universal HDMI out means that any HDTV worldwide should easily support either console. On the other hand the USB power supply is not included in the Family Computer Classic Edition and can be purchased for ¥1000 ($10) if needed. Those picking up both versions can most likely use the included NES Classic Edition cable and it’s probably the common micro-USB plug type. Also the Famicom Mini, like the original Famicom, has two controllers wired directly into the console and are not removable. As for games, 8 titles are unique to each region, so 22 of these titles are on both consoles. Here’s a quick list of those and you can expect a video of these region specific titles coming soon.